The most appropriate level for realizing the principles of Integrated Flood Management is the basin level. Although the sizes of river basins vary greatly, basins are hydrological systems that have common characteristics which are interrelated. Changes in the characteristics of the basin have an influence on the characteristic and magnitude of the flood regime. Thus, if floods are to be managed in an integrated manner, flood management plans have to take account of the entire basin including all kinds of flood related activities and upstream downstreams relations. 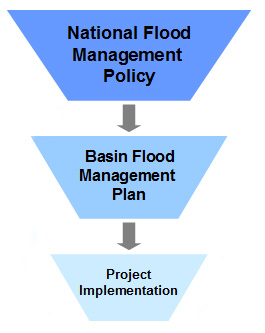 Basin flood management plans provide the essential link between the national and local level of flood management. On the one hand they are embedded in the general framework of the national flood management policy and on the other hand they are tailored to reflect the specific characteristics of the basin. This module will guide the reader through the process of formulating a basin flood management plan in a step by step mode. For more detailed information it is recommended to refer to the downloadable Tool Paper "Formulating a Basin Flood Management Plan" (see right border) and to follow the links provided throughout the module.